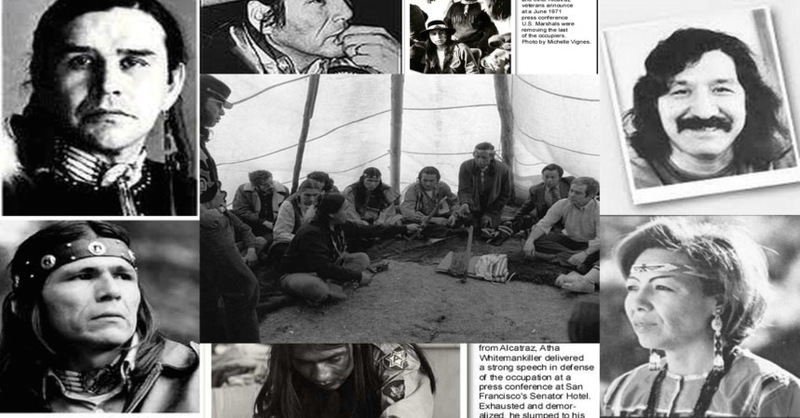 In the 30 years of its formal history, the American Indian Movement (AIM) has given witness to a great many changes. We say formal history, because the movement existed for 500 years without a name. The leaders and members of today's AIM never fail to remember all of those who have traveled on before, having given their talent and their lives for the survival of the people. 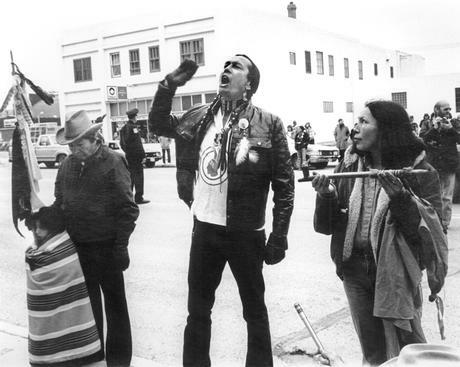 At the core of the movement is Indian leadership under the direction of NeeGawNwayWeeDun, Clyde H. Bellecourt, and others. Making steady progress, the movement has transformed policy making into programs and organizations that have served Indian people in many communities. These policies have consistently been made in consultation with spiritual leaders and elders.The success of these efforts is indisputable, but perhaps even greater than the accomplishments is the vision defining what AIM stands for. It has not been an easy path. Spiritual leaders and elders foresaw the testing of AIM's strength and stamina. Doubters, infiltrators, those who wished they were in the leadership, and those who didn't want to be but wanted to tear down and take away have had their turns. No one, inside or outside the movement, has so far been able to destroy the will and strength of AIM's solidarity. Men and women, adults and children are continuously urged to stay strong spiritually, and to always remember that the movement is greater than the accomplishments or faults of its leaders. Restoration of treaty making (ended by Congress in 1871). Establishment of a treaty commission to make new treaties (with sovereign Native Nations). Indian leaders to address Congress. Review of treaty commitments and violations. Unratified treaties to go before the Senate. All Indians to be governed by treaty relations. Relief for Native Nations for treaty rights violations. Recognition of the right of Indians to interpret treaties. Joint Congressional Committee to be formed on reconstruction of Indian relations. Restoration of 110 million acres of land taken away from Native Nations by the United States. Repeal of state jurisdiction on Native Nations. Federal protection for offenses against Indians. Abolishment of the Bureau of Indian Affairs. Creation of a new office of Federal Indian Relations. New office to remedy breakdown in the constitutionally prescribed relationships between the United States and Native Nations. Native Nations to be immune to commerce regulation, taxes, trade restrictions of states. Indian religious freedom and cultural integrity protected. Reclaim and affirm health, housing, employment, economic development, and education for all Indian people. The Preamble and complete text of the Trail of Broken Treaties 20-Point Indian Manifesto. 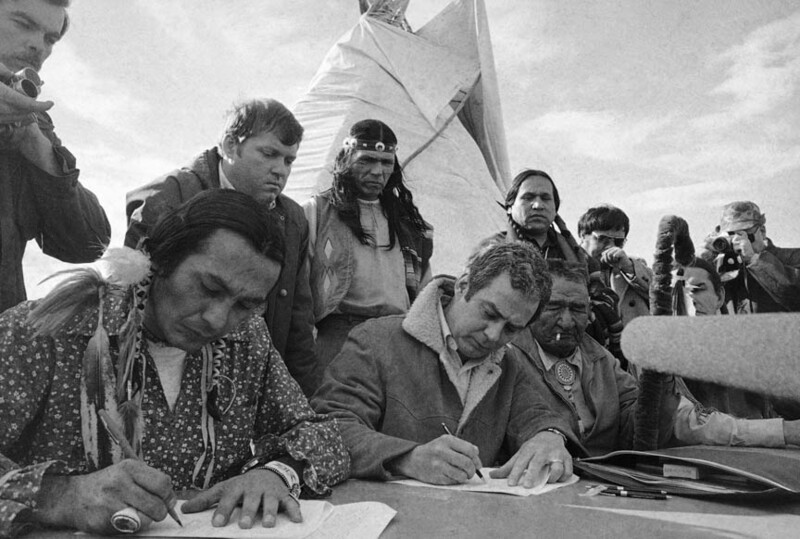 These twenty points, twenty-six years later, state clearly what has to happen if there is to be protection of Native rights, and a future free from the dictates of the country that surrounds the Native Nations. These claims clearly reaffirm that Indian people are sovereign people. Despite the history and the accomplishments, AIM is difficult to identify for some people. It seems to stand for many things at once -- the protection of treaty rights and the preservation of spirituality and culture. But what else? Unlike the American civil rights movement, with which it has been compared, AIM has seen self-determination and racism differently. Desegregation was not a goal. Individual rights were not placed ahead of the preservation of Native Nation sovereignty. At the 1971 AIM national conference it was decided that translating policy to practice meant building organizations -- schools and housing and employment services. In Minnesota, AIM's birthplace, that is exactly what was done. Over the years, as the organizations have grown, they have continued to serve the community from a base of Indian culture. Before AIM in 1968, culture had been weakened in most Indian communities due to U.S. policy, the American boarding schools and all the other efforts to extinguish Indian secular and spiritual life. Now, many groups cannot remember a time without culture. This great revival has also helped to restore spiritual leaders and elders to their former positions of esteem for the wisdom and the history they hold. All of these actions are in concert with the principles of AIM and came into being at this time in history because Indian people have refused to relinquish their sovereign right to exist as free and uncolonized people. 1968 MINNEAPOLIS AIM PATROL : created to address issues of extensive police brutality. 1969 ALCATRAZ ISLAND occupied for 19 months. 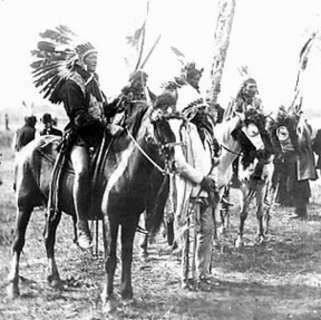 AIM was there when United Indians of All Tribes reclaimed federal land in the name of Native Nations. First Indian radio broadcasts--Radio Free Alcatraz--heard in the Bay Area of San Francisco. INDIAN HEALTH BOARD of Minneapolis founded. This is the first Indian urban-based health care provider in the nation. 1970 LEGAL RIGHTS CENTER : created to assist in alleviating legal issues facing Indian people. (In 1994, over 19,000 clients have had legal representation, thanks to AIM's founding of the Legal Rights Center). 1970 AIM takeover of abandoned property at the naval air station near Minneapolis focuses attention on Indian education and leads to early grants for Indian education. CITIZEN'S ARREST OF JOHN OLD CROW: Takeover of the Bureau of Indian Affairs' main office in Washington D.C. to show improper BIA policies. 24 arrested for "trespassing" and released. BIA Commissioner Louis Bruce shows his AIM membership card at the meeting held after the release of those arrested. FIRST NATIONAL AIM CONFERENCE: 18 chapters of AIM convened to develop long-range strategy for future directions of the movement. TAKEOVER OF DAM: AIM assists the Lac Court Orieles Ojibwa in Wisconsin in taking over a dam controlled by Northern States Power which flooded much of the reservation land. This action leads to support by government officials and eventual settlement, returning over 25,000 acres of land to the tribe and actually providing significant monies and business opportunities to the tribe. 1972 RED SCHOOL HOUSE : the second survival school to open, offering culturally based education services to K-12 students in St. Paul, MN. HEART OF THE EARTH SURVIVAL SCHOOL: a K-12 school established to address the extremely high drop-out rate among American Indian students and lack of cultural programming. HOTESS serves as the first model of community-based, student-centered education with culturally correct curriculum operating under parental control. 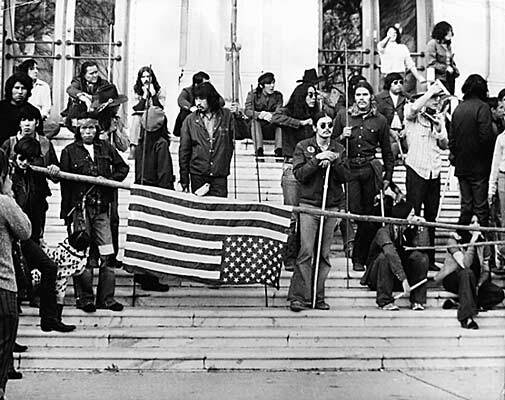 TRAIL OF BROKEN TREATIES : a march on Washington, DC ending in the occupation of BIA headquarters and resulting in the presentation of a 20-point solution paper to President Nixon. 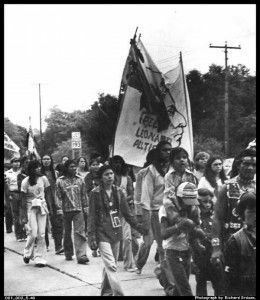 1973 LEGAL ACTION FOR SCHOOL FUNDS: In reaction to the Trail of Broken Treaties the government abruptly canceled education grants to Heart of the Earth Survival School, Red School House and the Indian Community School of Milwaukee. Through successful legal action, the US District Court orders the grants restored and government payment of costs and attorney fees. 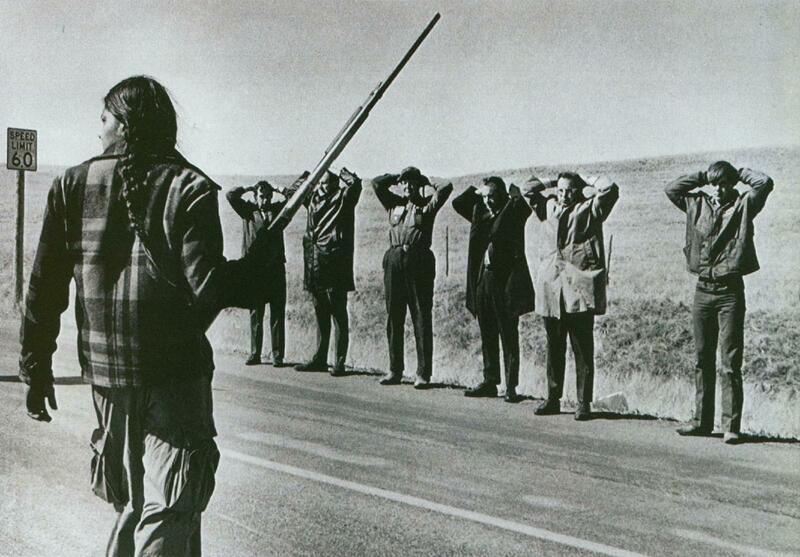 WOUNDED KNEE '73: AIM was contacted by Lakota elders for assistance in dealing with the corruption within the BIA and Tribal Council, which led to the famed 71-day occupation and battle with the US. armed forces. 1974 INTERNATIONAL INDIAN TREATY COUNCIL (IITC): an organization representing Indian peoples throughout the western hemisphere at the United Nations in Geneva, Switzerland. 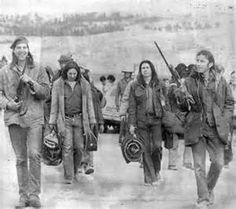 WOUNDED KNEE TRIALS: Eight months of trials in Minneapolis resulted from events which occurred during the 1973 Wounded Knee occupation. This was the longest Federal trial in the history of the United States. Many instances of government misconduct were revealed with the result that US District judge Fred Nichol dismissed all charges due to government "misconduct" which "formed a pattern throughout the course of the trial" so that "the waters of justice have been polluted." 1975 FEDERATION OF SURVIVAL SCHOOLS: created to provide advocacy and networking skills to 16 survival schools throughout the US and Canada. 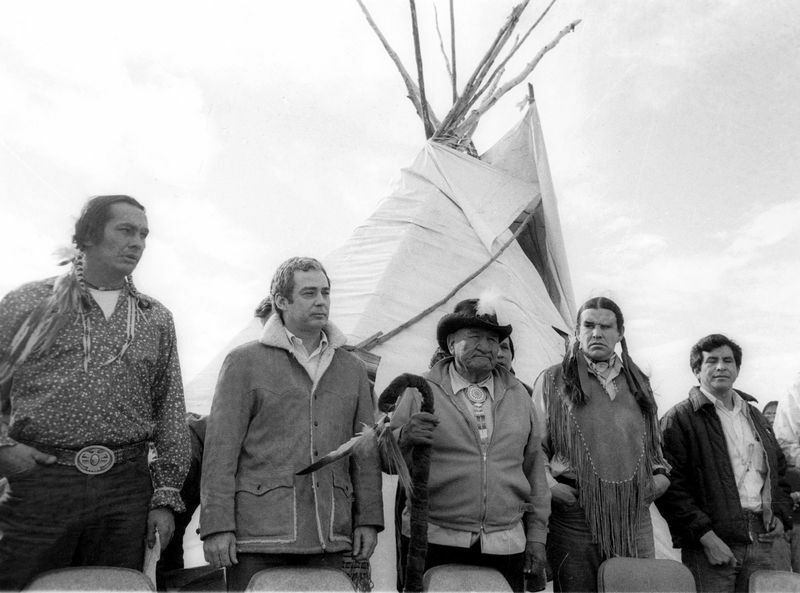 LITTLE EARTH OF UNITED TRIBES: HUD chose AIM to be the prime sponsor of the first Indian-run housing project. 1977 MIGIZI Communications founded in Minneapolis. The organization is dedicated to produce Indian news and information and educate students of all ages as tomorrow's technical work force. INTERNATIONAL INDIAN TREATY COUNCIL: establishes Non-government organization status within United Nations in Geneva and attends the International NGO conference and presents testimony to the United Nations. AMERICAN INDIAN LANGUAGE AND CULTURE LEGISLATION: AIM introduces legislative language which is adopted, recognizing State responsibility for Indian education and culture. This legislation was recognized as a model throughout the country. AIM establishes the first adult education program at Stillwater Prison in Minnesota. Programs later established at other state correctional facilities modeled after the Minnesota program. CIRCLE OF LIFE SURVIVAL SCHOOL established on the White Earth Indian Reservation in Minnesota. The school receives funding for three years of operation from the U.S. Department of Education. RUN FOR SURVIVAL: AIM youth organize and conduct 500-mile run from Minneapolis to Lawrence, Kansas to support "The Longest Walk." THE LONGEST WALK: Indian Nations walk across the US from California to DC to protest anti-Indian legislation calling for the abrogation of treaties. A tipi is set up and maintained on the grounds of the White House. The proposed anti-Indian legislation is defeated. WOMEN OF ALL RED NATIONS (WARN): established to address issues directly facing Indian women and their families. 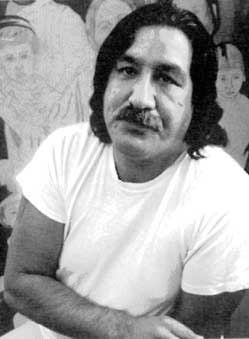 1979 LITTLE EARTH HOUSING PROTECTED: an attempt by the US Department of Housing and Urban Development to foreclose on the Little Earth of United Tribes housing project is halted by legal action and the US District Court issues an injunction against HUD. AMERICAN INDIAN OPPORTUNITIES INDUSTRIALIZATION CENTER (AIOIC): creates job training schools to attack the outrageous unemployment issues of Indian people. Over 17,000 Native Americans have been trained for jobs since AIM created the American Indian Opportunities Industrialization Center in 1979. ANISHINABE AKEENG Organization is created to regain stolen and tax forfeited land on the White Earth Reservation in Minnesota. 1984 FEDERATION of NATIVE CONTROLLED SURVIVAL SCHOOLS presents legal education seminars for educators of Indian children at colleges and law schools in Minnesota, Wisconsin, California, South Dakota, Nebraska and Oklahoma. National conference held in San Jose, California, concurrent with the National Indian Education Association Convention. 1986 SCHOOLS LAWSUIT: Heart of the Earth and Red School House--successfully sue the U.S. Department of Education, Indian Education Programs for unfairly ranking the schools' programs below funding recommendation levels. The schools proved bias in the system of ranking by the Department staff. 1987 AIM PATROL: Minneapolis AIM Patrol comes full circle in restarting the Patrol to deal with the serial killings of American Indian women in Minneapolis. 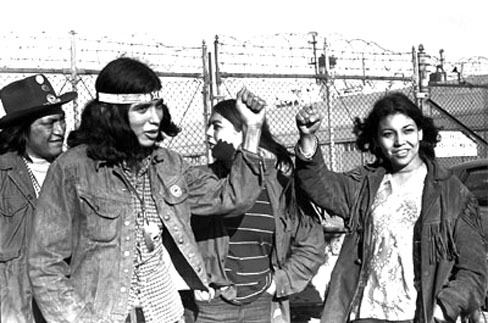 1988 ELAINE STATELY INDIAN YOUTH SERVICES (ESIYS): developed to create alternatives for youth as a direct diversion to gang-involvement of Indian youth. FORT SNELLING AIM ANNUAL POW WOW: With the 20th Anniversary of AIM, an annual pow wow is established at historic Fort Snelling. The event becomes the largest Labor Day Weekend event in any Minnesota state park. 1989 SPEARFISHING: AIM is requested to provide expertise in dealing with angry protesters on boat landings. Spearfishing continues despite violence, arrests, and threats from white racists. Senator Daniel Inouye calls for a study on the effects of Indian spearfishing. The study shows only 6% of fish taken are by Indians. Sports fishing accounts for the rest. 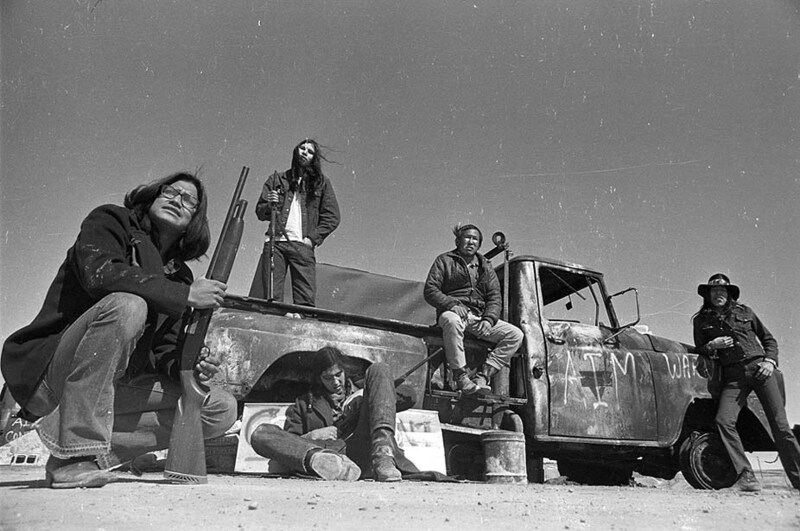 1991 PEACEMAKER CENTER: with an American Indian spiritual base, AIM houses its AIM Patrol and ESIYS in a center in the heart of the Indian community. SUNDANCE RETURNED TO MINNESOTA. With the support of the Dakota communities, a great spiritual rebirth took place at Pipestone, Minnesota. Ojibwe nations, too, have helped make the Minnesota Sundance possible. The Pipestone Sundance has since become an annual event. In 1991, leaders of the Oglala Lakota, Cheyenne and other nations declared independence from the United States. The group established a provisional government and began the other work of developing a separate nation. NATIONAL COALITION ON RACISM IN SPORTS AND MEDIA: organized to address the use of Indians as sports team mascots. AIM led a walk in Minneapolis to the 1992 Superbowl. In 1994, the Minneapolis Star-Tribune agreed to stop using professional sports team names that refer to Indian people. 1992 THE FOOD CONNECTION: organized summer youth jobs program with an organic garden and spiritual camp (Common Ground) at Tonkawood Farm in Orono MN. 1993 EXPANSION OF AMERICAN INDIAN OIC JOB TRAINING PROGRAM: the Grand Metropolitan, Inc. of Great Britain, a parent of the Pillsbury Corporation merges its job training program with that of AIOIC and pledges future monies and support. LITTLE EARTH: after an 18-year struggle, HUD secretary Cisneros rules that Little Earth of United Tribes housing project shall retain the right to Indian preference. 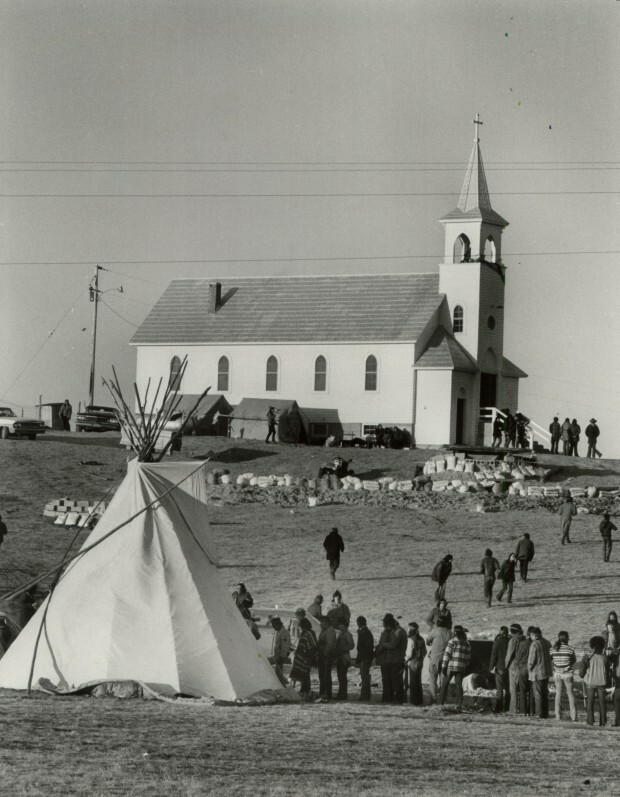 WOUNDED KNEE ANNIVERSARY: Gathering for a twentieth anniversary of the Wounded Knee action, Oglala Sioux tribal president thanks AIM for the 1973 actions. July 27 - August 3, 1996 - The second meeting for the Intercontinental Encounter for Humanity and Against Neo-Liberalism was again hosted by the EZLN and was attended by delegates of the International Indian Treaty Council and the American Indian Movement. 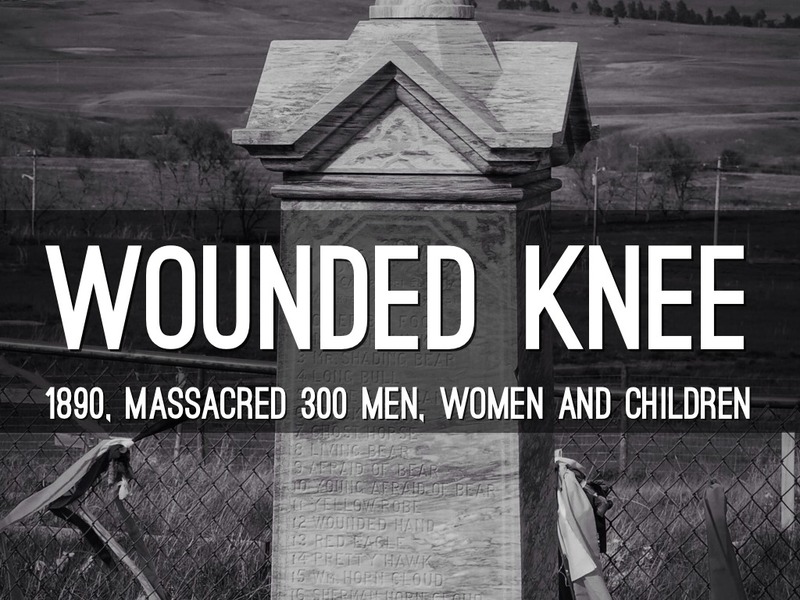 1998 February 27, 1998 - 25th Anniversary of Wounded Knee, an Oglala Lakota Nation resolution established February 27th as a National Day of Liberation. July 16-19, 1998 - 25th Annual Lac Courte Oreilles Honor the Earth Homecoming Celebration to celebrate and honor the people of Lac Courte Oreilles and the American Indian Movement who participated in the July 31, 1971 takeover of the Winter Dam and the Birth of Honor the Earth. August 2-11, 1998 - 30th Anniversary of the American Indian Movement Grand Governing Council; Sacred Pipestone Quarries in Pipestone, Minnesota. Welcoming Feast and Celebration/Conference commemorating AIM's 30th Anniversary. February, 1999 - Three activists working with a group of UÕwa Indians in Colombia kidnapped by rebels. Ingrid Washinawatok, 41 (Menominee), a humanitarian, Terence Freitas, 24, an environmental scientist from Santa Cruz, California, and LaheÕenaÕe Gay, 39 of Hawaii were seized near the village of Royota, in Arauca province in northeastern Colombia on Thursday, February 25th while preparing to leave the territory of the UÕwa after a two week on-site visit. Ingrid, Lahe and Terence were kidnapped on February 25th by armed gunmen in Uw'a Indian Territory of northeastern Columbia. On March 5th, their brutalized and bullet-riddled bodies were discovered across the border in Venezuela. October, 2000 – Commission to seek justice for Ingrid Washinawatok and companions established. March 2001 – Representatives of the American Indian Movement Grand Governing Council attend the Zapatista Army of National Liberation March for Peace, Justice and Dignity, Zocolo Plaza, Mexico City.